(CNN) -- The French Navy said they seized 11 pirates Sunday after they apparently mistook a French military vessel for a commercial ship and made a run at it. 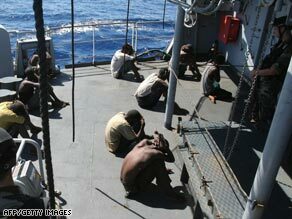 A French navy sailor speaks to one of 11 pirates on board the French warship the Nivose after their capture. The helicopter fired warning shots, he said. The pirates, who had a mother ship as well as the two assault boats, are being held for questioning on the Nivose, Prazuck said. The vessels were carrying AK-47 rifles and rocket-propelled grenades, but the pirates did not fire, he said. The incident took place about 1,000 km (620 miles) east of Mombasa, Kenya, at 8:30 a.m. local time (0430 GMT) he added. In the past three weeks, the Nivose has intercepted 24 suspected pirates as part of a European Union anti-piracy operation off the coast of Somalia, which has become a piracy hotspot. Over the past year, more than 100 suspected pirates have been picked up, Prazuck said. Of that total, 27 have been released, and more than 70 taken to jail in France, handed to authorities in Somalia or taken to Kenya under an EU agreement with the government in Nairobi. The Nivose seized three other suspected pirates Thursday morning, the French military spokesman said, but released them the next day for lack of evidence. But a day later, the Seychelles coast guard picked up the same three men. They claimed they were fishermen, but had no license to fish in the Seychelles exclusive economic zone, Prazuck said. Pirates seized a ship that was carrying wheat and used vehicles to Mogadishu, Somalia, on Saturday, according to NATO, which also patrols the area. The ship, the Almezaan, now appears to be heading for a Somali village called Harradera, known as a pirate base, Cmdr. Chris Davies told CNN. The ship did not send a distress signal until 4 a.m. Sunday, 18 hours after it was hijacked in the Indian Ocean, he said. No NATO ships were in the area at the time, he added. The Panamanian-flagged ship had a crew of 18 Indians as of April 2008, the last listing for it on the Web site of the International Transport Workers' Federation. Pirates also hijacked a British-owned bulk carrier in the Indian Ocean. The MV Ariana was carrying 35,000 tons of soya about 250 nautical miles (287 miles) northwest of the Seychelles when it was seized around dawn. The crew members are Ukrainians and they are not believed to be harmed, NATO said. It is unclear how many crew members were aboard the vessel and how it came to be attacked. NATO said it was unaware of ransom demands or any threats against those aboard.